The original meaning of this word is uncertain; apparent reflexes refer to unripe or fallen fruit, and a tree species. Maori: mariri, (Under-ripe fruit of tawa, Beilschmiedia tawa, Lauraceae). Ancient storm-damaged Malili (Terminalia richii) on roadside near the Bahai Temple, Tiapapata, Samoa. It is difficult to decide whether there are two distinct inherited words here, both Proto Nuclear Polynesian (i.e. originating in Samoa before the migrations to Eastern Polynesia were well-advanced), or just one which has acquired multiple meanings, both retained in Samoa and the Marquesas but only one of which has survived in the other Eastern Polynesian languages. In Samoa and the Marquesas māriri or mariri (long vowel in Samoan, short in Marquesan) denotes a tall forest tree of the genus Terminalia -- Terminalia richii in Samoa (a tree also found in Niue), and T. catappa, a much more widely distributed species, along with the indigenous T. glabrata var. brownii in the Marquesas. Terminalia catappa is also found on the sea shore on Midway Island (where the photograph on the left was taken). The Samoan mālili grows to about 35m high. It has lance-shaped leaves, dark green on top and lighter underneath. These appear on the tips of twigs and branches, hence open appearance of the tree, right up to the canopy where most of the fruits are found. The fruits are reddish-purple when ripe, much loved by large birds like pigeons (native pigeons are also endangered species in Samoa and the Marquesas Islands). 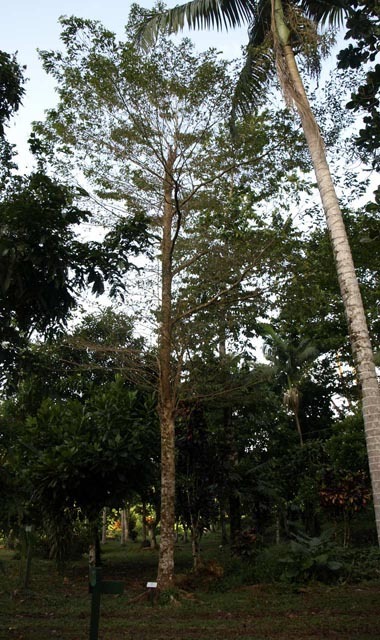 Malili is a good timber tree for building, panelling and furniture, which, along with the clearing of forest for agriculture has contributed to its decline. However, there is now an active revegetation programme (although people I spoke to in Samoa in June 2014 thought that a related species with similar qualities was being substitited for the native malili). In the Marquesas, the related species Terminalia catappa is called ma'i'i. (In Marquesan, Proto Poynesian "l" is usually replaced by a glottal stop, denoted by an apostrophe when written, if people bother to mark it). It is one of the trees on which the critically endangered 'upe (rupe) or Imperial Pigeon (Ducula galatea) often rests and occasionally feeds. This is also a forest tree growing up to about 35 metres tall, but is very widely distributed, probably originating in tropical Southeast Asia, but spread throughout the tropical Pacific and as far west as Africa, widely cultivated both for its fruit (the "tropical almond", edible by humans as well as pigeons) and timber, along with the medicinal properties of its leaves. The leaves and flowers of this species are illustrated on the left. Terminalia catappa may well have been carried into Polynesia during the migrations; its Proto Malayo Polynesian name has been reconstructed as *talisay, coming into Proto Polynesian as *talie (retaining the same form in modern Samoan, with cognate words in other Polynesian languages, but not in Maori; in the Marquesas, however, the counterpart form ta'ie denotes the fruit of T. catappa; the tree is ma'i'i.). 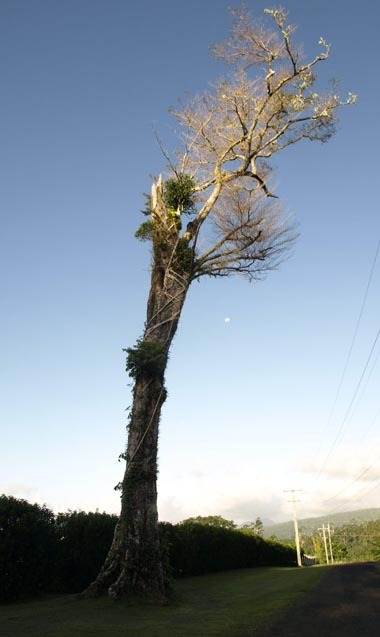 Interestingly, in Samoa this tree is also known as 'auali'i, which possibly does have a Maori counterpart, kawariki, from a common Nuclear Polynesian source, *kaualiki. The other meaning of words apparently derived from *malili has to do with the ripening fruit of a particular species of tree or a premature fruit fall. Both shades of meaning are reflected in Samoan and Marquesan, distinguished by vowel length in Samoan and possibly Marquesan (the sources I have been able to consult about Marquesan do not mark vowel length). There may well originally have been two words, *mālili for the tree, and *malili for the fruit fall, which converged in some languages and lost one of the alternative meanings over time. In Samoan, malili denotes immature fruit falling from the tree, and the corresponding word in Marquesan denotes the ripening fruit of the breadfruit tree (Artocarpus altilis, Proto Polynesian *kulu), illustrated on the left. In Maori māriri (long vowel) denotes the unripe fruit of the tawa (Beilschmiedia tawa), another tall forest tree whose fruits are much favoured by pigeons. Further reading: The bookTraditional Trees of Pacific Islands: Their Culture, Environment, and Use, edited by Craig R. Elevitch, and with contributions by many leading botanists and forestry experts (Holualoha, Hawaii: Permanent Agriculture Resources (PAR), 2006), has very detailed information about both these species of Terminalia. There are also articles and photographs of both species (and others in the genus) on Wikipedia. Photographs: The photographs of Terminalia richii are by R.B., the others are by the Hawaiian environmentalists Forrest and Kim Starr.